1. Short machiatto, Adelaide Airport, 28th November 2010. I had an exact amount in change; I can’t remember the sum. $1.85? $2.30? It makes no odds. The facts were thus: I was traveling beyond Queensland for the first time since hitting Australia, I was waiting for my two travel companions to get in, and there was only two coffees which I could actually afford with the change in my pocket: an espresso shot, which would have left a few cents over, or a short machiatto, which cleaned me out exactly. It was obviously fate. 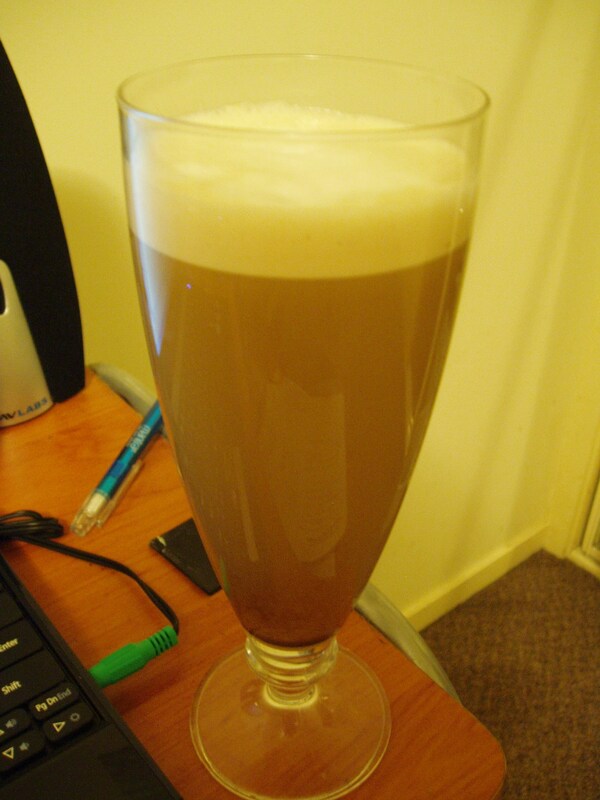 A short machiatto is an espresso shot—about 30ml of coffee—with frothy bits on the top. I managed to nurse it for a good fifteen minutes. 2. Long machiatto, Hudson’s Coffee, Melbourne, 2nd December 2010. I think this was the first time I ordered such a thing. Unlike other coffee chains, Hudson’s are good enough to have a menu which explains what all those strange Italian words actually mean (while we’re at it, “tall, grande, venti”? Get stuffed Starbucks, I’d like a large thanks. Actually, sorry for the proliferation of such words here, they drive me nuts too. I’m not being pretentious or anything, I freely admit that I still have no idea what half of them are.) Anyway, I read the description for the long machiatto (two espresso shots, boiling water to top it up, fluffy milk), risked one—with hazelnut as I recall, though I’ve largely dropped this affectation—and I was hooked. But that isn’t why this coffee was special. It was special because I was in Melbourne, I’d just spent an hour sitting on the best park bench in the world, and I wrote some postcards with my nice fancy University of Edinburgh pen while a sudden cloudburst spattered on the window. 3. Terrible train coffee, train, Canberra-Sydney, 13th December 2010. This coffee was terrible. But it jolted my sleepy brain into sudden productivity, and I poured out several pages of notes which may well someday be at the core of my second novel-manuscript. I feel it deserves a mention as a result. Gods, though, it was foul. 4. Long machiatto, cappuccino, Edith Piaf, Three Monkeys, West End, Brisbane, 18th December 2010. Yes, that’s a lot of coffee (and commas). The second one was because Soraya bought then didn’t want it, and the third was because it was raining so we stayed a while and I saw it on the menu and it was called an “Edith Piaf”and I had a vague hope it would actually just be a little old woman made out of pure caffeine. Turned out it was a massive bowl of coffee, but that was quite alright, because this place sells—or at least sold on that one day—what may be the best coffee I’ve ever tasted in my life. The first one was the best of all. West End was one of the worst-hit ‘burbs by the flooding—I hope they kept the coffee beans dry. This was also the last day I saw Morgan Wegner. I trust she won’t mind sharing its significance with three cups of bitter fluid. 5. Flat white, Newcastle, 27th December 2010. This day actually turned a little flat itself, later on. Train schedules meant I had almost the whole day in Newcastle, which as it turns out isn’t really a place with enough entertainment to last a lone traveller a whole day, especially when everything’s still shut for the holidays. But at this stage, all was resplendent. I’d been walking along the cliffs, the café was right on the beachfront, I had a croissant with it. Yeahhh. I sat by myself and drank slowly and wrote things in my notebook and felt incredibly writerly. So as you can gather, I’ve been becoming a little bit obsessed with the ol’ bean in recent days. The discovery of a coffee-plunger in one of my kitchen cupboards was a dangerous day indeed, especially coupled with the existence of “Chicco D’Oro” in my local supermarkets, a brand of ground coffee that for no reason I can make out costs half as much as any of the others. 1. Nescafe instant, Rachael Murray’s house, January 27th 2011. I’m sorry Rachael. I really am. I don’t know what happened. Five minutes after writing this post, I made this. The Bean Gods are clearly happy with this tribute. If you get *really* bored in Newcastle one day, you should go into rival coffee chains and ask for a “grande” or “venti” coffee… I’ve heard reactions can be amusing. Also, I’ve heard that Oz does amazinnnng iced coffee, which is sold in bottles “like milk cartons”. Can we have a description, please? After all, it is item no. 32 on the list of REASONS MUST GO TO OZ. The cartoned iced coffee is actually really disappointing, but I keep expecting it to be good and as such keep buying it. There’s something of a flavoured-milky-drink obsession in the chillers of Oz (although no Frijj, alas)–possibly my favourite is this bizarre Egg-Nog…thing, which advertises itself as a “meal you can drink”, and tastes of sugary egg. If I were you, I’d replace #32 with the Cherry Ripe. ng linked, neither hard nor soft g.